Watermelon cocktails could be the quintessential summer drink. 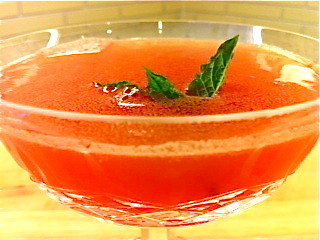 Once you've made your own watermelon juice (see below), try mixing it with a variety of spirits until you find your favorite combination for a watermelon cocktail. I'd argue that the juice goes well with anything, just remember that it's not as sweet in liquid form. To make fresh watermelon juice, chop up bite size pieces without the rind and put them into a food processor or blender. Blend well, then filter into a glass through a colander or even better, a confection sifter. Or buy a juicer :). If you love watermelon cocktails, try this Watermelon Margarita.